NOAA Arctic Program Leads, including PMEL scientist and Arctic expert Dr. James Overland, collaborated on the development and recent publication of NOAA's Arctic Action Plan. The plan provides a roadmap to making shared progress in monitoring, understanding, and protecting the vulnerable Arctic region. PMEL is actively involved in Arctic climate dynamics research, conducting observations and evaluating models of Arctic sea ice to document and predict climate change impacts on Arctic marine ecosystems. 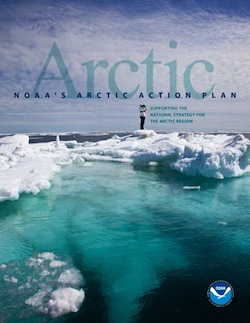 Find out more on the NOAA Arctic theme page and PMEL Arctic research web pages.